To the parliaments of European states, the parliaments of the G20 states, the Inter-Parliamentary Assembly of the Member States of the Commonwealth of Independent States, the Parliamentary Assembly of the Collective Security Treaty Organization, the European Parliament, the Parliamentary Assembly of the Organization for Security and Cooperation in Europe, the Parliamentary Assembly of the Black Sea Economic Cooperation, the Parliamentary Assembly Council of Europe, the Parliamentary Assembly of the Mediterranean due to the exacerbation of the international the situation as a result of the continuing provocative actions of the Ukrainian authorities. Deputies of the State Duma of the Federal Assembly of the Russian Federation appeal to their colleagues in the parliaments of the world’s states, international parliamentary organizations in connection with the continuing provocative actions of the Ukrainian authorities, pushed by their external patrons to escalate tension in the interests far from the interests of peace and stability in Europe. The deputies of the State Duma sincerely wish to bring to their fellow parliamentarians objective information about the threat to regional security as a result of a number of illegal actions by the leadership of Ukraine and the assessment of this threat. The culprit of the current aggravation of the situation is P. Poroshenko, catastrophically losing his rating among Ukrainian voters. On the eve of the presidential elections, he cynically and recklessly trying to turn the tide in his favor, to remove from the political field his opponents – supporters of a peaceful dialogue and solving conflict situations through negotiations. The course is still going to the dirtiest and cruel tricks. Today’s Kiev does not in the least halt the fact that the lives of civilians and military personnel of their own country, who have become hostages of P. Poroshenko’s political greed, are put at risk. Another provocative manifestation of such a “policy” was on November 25, 2018: at 7:10 am Moscow time, three ships of the Naval Forces of Ukraine violated the State Border of the Russian Federation near the coast of the Krasnodar Territory in coordinates 44 ° 52 ‘of northern latitude and 36 ° 31´ eastern longitude, which was internationally recognized before the events of 2014. The provocative nature of these actions is confirmed by the fact that the Ukrainian military was well aware of the order of passage of the Kerch Strait, which they used earlier (in September 2018) with the involvement of the Russian vessel. The Ukrainian side did not apply for the permit on using the passage in the Kerch-Yenikalsky Canal. Such permits are in the interests of the safety of navigation. The Ukrainian military ignored the warnings and legal requirements of the Russian border guards, pointed weapons to them, dangerously maneuvered, and created a threat to the safe navigation of civilian ships in the waters. Thus, the UN Charter, as well as Articles 19, 21, 25 of the UN Convention on the Marine Law of 1982 (in particular, the coastal state’s right to ensure security in the maritime space, the rules of peaceful passage in territorial waters, in this case of the Russian Federation). Only due to the high professionalism of the Russian border and military services, which, acting in full compliance with the law and international law, were forced to use force warning, was it possible to prevent human casualties and other consequences. All victims received the necessary medical care, as well as the opportunity to contact relatives. The true goals of this provocative incident became clear after the release of martial law in the territories of those regions of Ukraine in which P. Poroshenko has the lowest level of support. P. Poroshenko clearly demonstrates the desire, by all means, to keep in power, even under the threat of a full-scale war. At the same time, he is trying to get essentially dictatorial powers in the most industrialized regions of the country, which suffered from economic and social degradation during his rule. Threatening with military mobilization, spinning the flywheel of anti-Russian hysteria, urging patrons of the Kiev regime in Washington to open an American military base in Ukraine, as well as increase the supply of modern lethal weapons, P. Poroshenko demonstrates approaches unacceptable for modern Europe. Confirmation that the border incident on the Russian coast on November 25, 2018, is a pre-planned provocation was a new wave of organized attacks by national radicals on diplomatic missions and consular offices of the Russian Federation in Ukraine. Kiev once again demonstrated disrespect for the Vienna Convention on Diplomatic Relations of April 18, 1961, and the Vienna Convention on Consular Relations of April 24, 1963, regarding the inviolability of the Embassy of the Russian Federation and general consulates of the Russian Federation in Ukraine. In addition, in recent days, attacks on Russian cargo carriers and offices of Russian companies on the territory of Ukraine have become more frequent, and a ban has been imposed on the entry into Ukraine for men – citizens of the Russian Federation – aged 16 to 60 years. 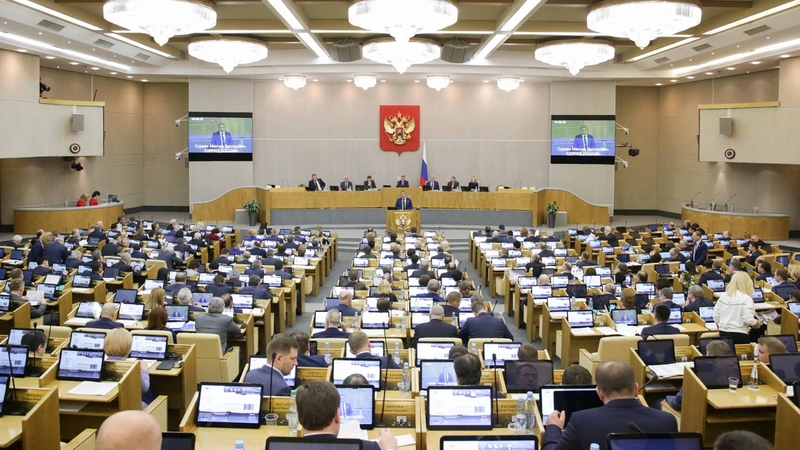 Deputies of the State Duma condemn the actions of the Ukrainian authorities and their external patrons aimed at aggravating the international situation in the Black Sea region and Europe as a whole, and also call on all peace-loving political forces, all sensible politicians to objectively assess the destructive policy of official Kiev and do everything necessary to prevent the threat to peace and stability emanating from P. Poroshenko and the current Kiev regime.